More from my Epic Ultramarines, a selection of amoured support. 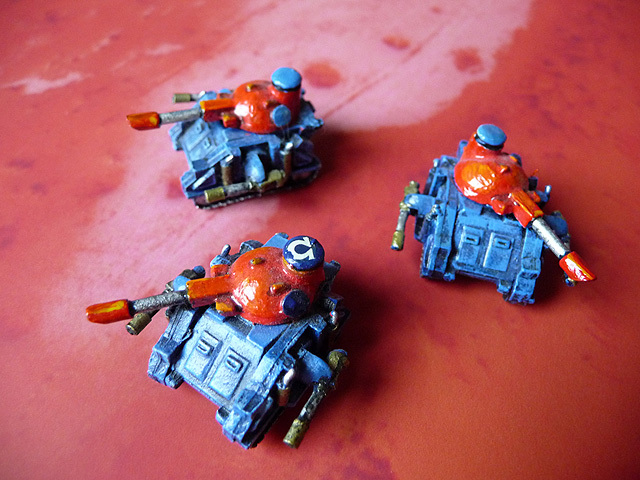 First up some original Predators, I actually attempted the same effect with my large scale Dark Angels - a ruddy great orange turret! 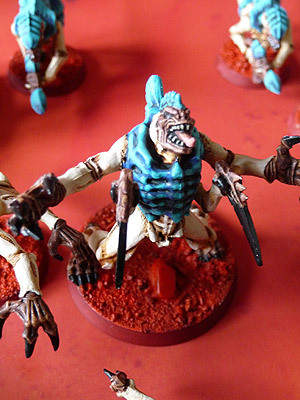 Unfortunately I can't find it anyhwere, so I currently have a 40k Predator chassis, with the las-cannon sponsons but no turret! 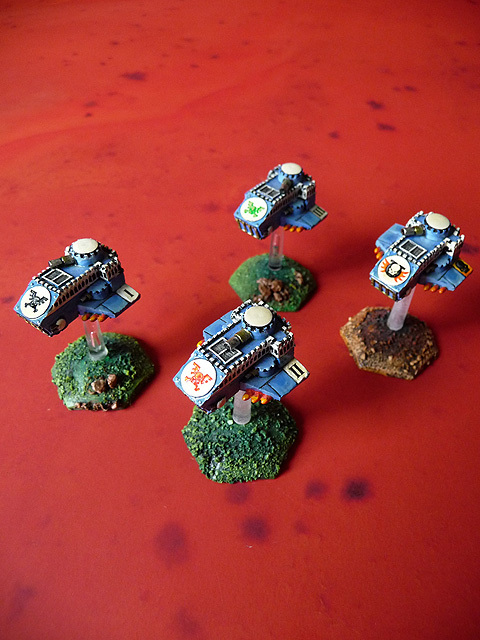 Original Whirlwinds, based on the DIY tutorial that was in White Dwarf. I made two full scale Whirlwind Turrets at the time, I've still got them and they're detachable so may wellfeature in my reborn Dark Angels force. Lastly, Vindicators. These are the Mk 2 design from Epic. 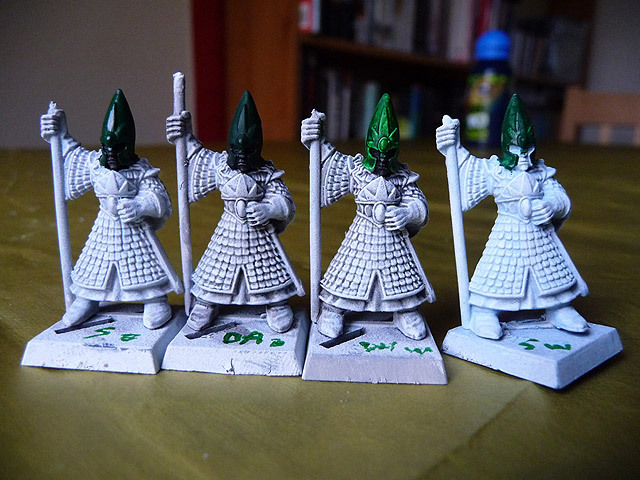 I have some of the original Mk 1's based on the DIY tutorial that was in White Dwarf but these were the ones I got fully painted, decalled and varnished. Maybe the decals are a bit Imperial Guard now but I still like the idea that these models have markings on top, so they can be seen clearly by Titans and Gunships overhead. It really brings a sense of scale. 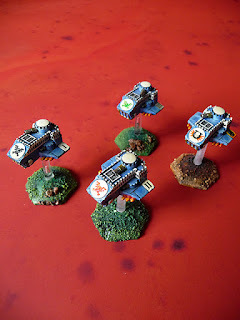 Here's my Thunderhawks. G.O.D. I loved Thunderhawks in Epic. They were the single best unit for Space Marines, shortly followed by Land Raiders and then Tarantulas [in my book]. Realistically there was no way the amount of stands suggested could fit inside one but they were the best delivery unit. 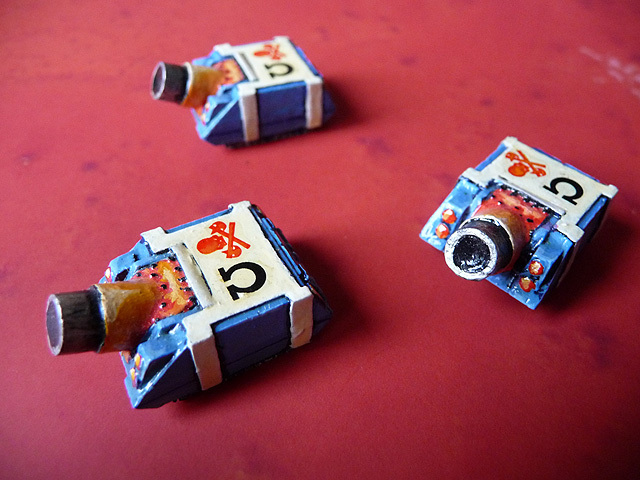 Drop pods were ridiculous, you put a stack of card drop pod markers on a blast template, balanced it on a ruler, then tipped the template, where a marker landed you replaced it with a pod. If it landed off-table or on terrain I think it was destroyed and even if it did land units on First Fire orders got to 'snap fire' at the incoming pods and blow them up before landing - useless! Better to have one of these babies swoop in from anywhere, blast hell out of everything with it's rockets and cannon and then carry on being a thorn in your opponents side for the remainder of the game. As you can see there's a squad of three for some Tactical Units and a personal transport, I think this was for a Chaplain, or an Inquisitor, whatever I felt was the best option at the time. 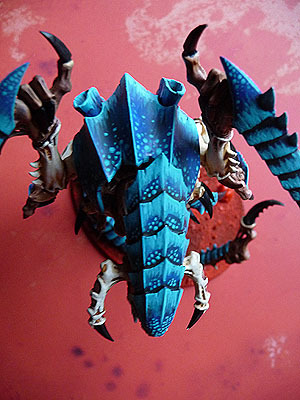 Two coloured decals were used to get the winged Ultramarine Skull. Not so sure how I feel the new version of the Thunderhawk shapes up against these, design-wise, then again these aren't exactly iconic [or even aerodynamic] but I've always liked them nontheless. 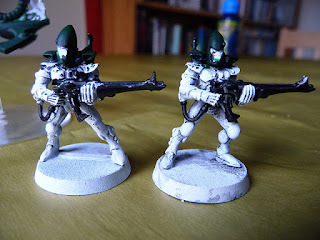 So my son got some Eldar for Christmas, that seems ages ago now but this blog isn't always current. Anyway despite my request for advice and my son's initial desire for Iyanden and Nacretineï he decided on Biel Tan. Not sure why, his cousin has White Scars army so they'll look very similar. 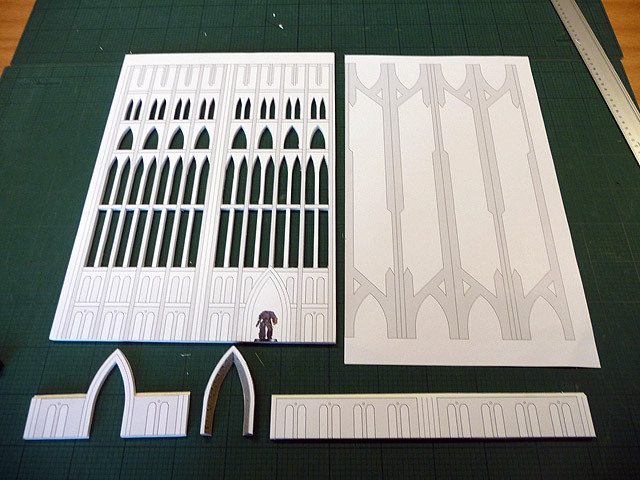 Now despite my instructions to 'not interfere' I thought I'd at least come up with some painting plans for him to follow so he could get a decent result. However, when I asked him if he wanted to start on some of my old Warhammer Fantasy Battle High Elves he said 'no, he'd rather go straight to the Guardians and Jetbike'. 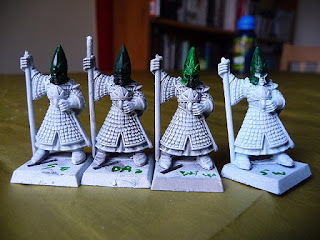 Of course I sat with him and painted these fellas whilst he did, ultimately wishing I hadn't because I found a better solution in my tests than the one I suggested based on this tutorial. I really liked Lloyd's guide and his Guardian looked cool but perhaps a beginner using Badab Black as a light wash for white isn't always going to be subtle. The right one is what he should have done, less mess, easier to do and quicker as it's one less paint to add. 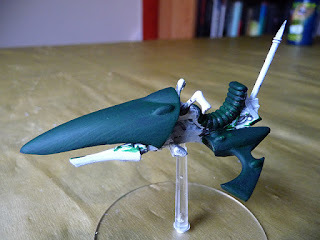 So here is my son's first Jetbike using the 'Vallejo Stonewall grey basecoat, Badab Black wash, with white drybrush [less subtle] and Black basecoat helmet with Vallejo Dark Green [matt] method. To be honest I can't say I've learned enough from my Being a Pushy Dad post. I've still helped to much, there were tears and tantrums and really I should just leave him to it. On the plus side we had two sessions of painting to get to this stage and he did instigate the second session which is progress in my book and I think I left him to it more the second time. 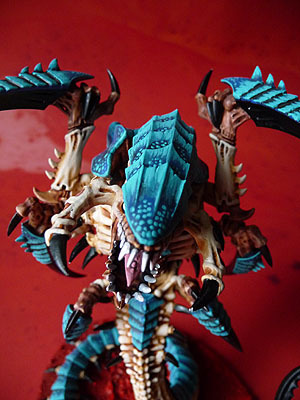 Inbetween all these Eldar I've got him painting a Genestealer and a base of Rippers but I've not photographed them. 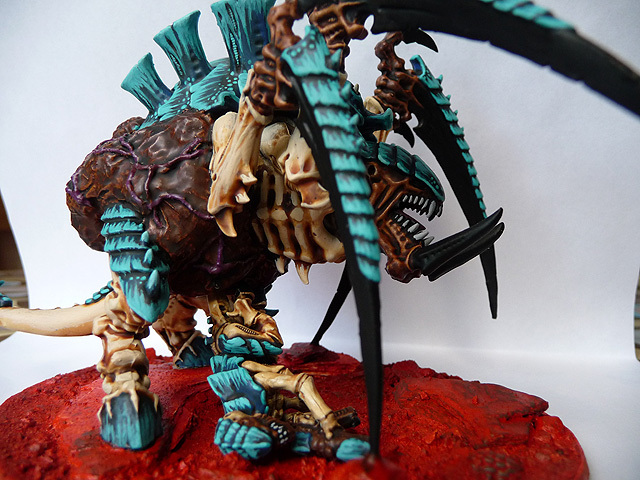 Now that you've seen how the Hive Fleet got it's colour scheme here's another example of a big gribbly. 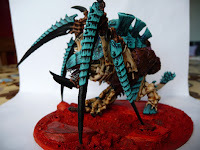 I'll put some bigger pics up at some point, he's had some highlights added to his talons since these were taken and I may add one final set of turquoise highlights, as I did with the Tervigon. The hardest part about painting a Trygon in this way is the tail, that baby goes on forever! Loads of striping and dotting |||| .:.:. 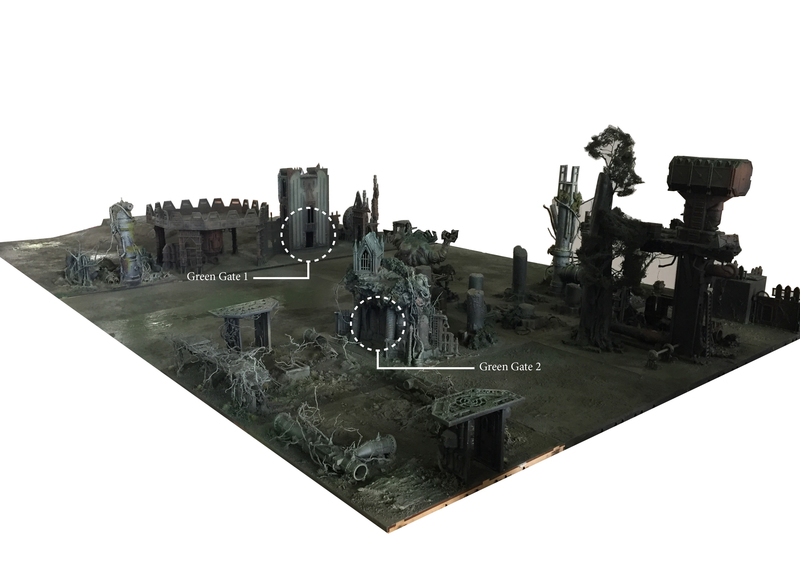 Terrain is everything - 40k Hex tower 1. 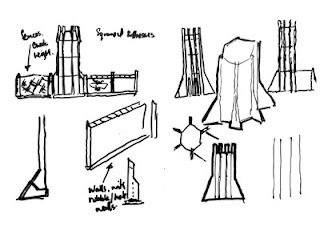 The tower would mainly be used as a scout outpost. Not entirely sure how the lookout would get up there but a lift might allow them to get the top because a spiral staircase would struggle, but what the hey! 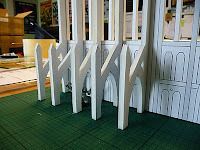 Lot's of issues with the buttresses twisting so it's not entirely plumb straight but this is the best angle. View it from another side and it's the leaning tower of Pizza. 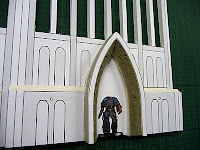 Here we go with the first of quite a few eked out posts on my Epic Ultramarines. 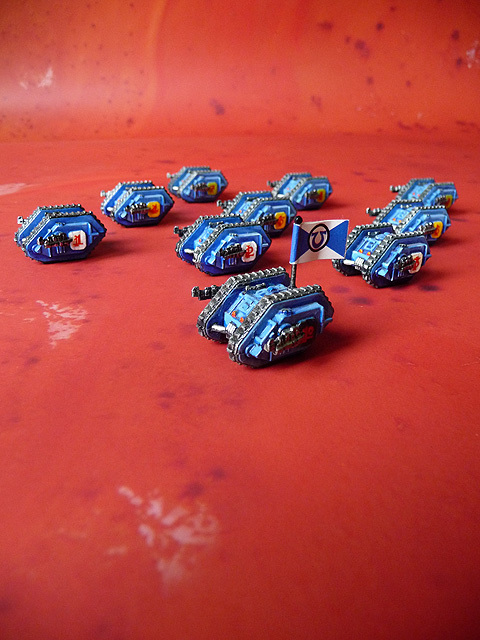 First a 10 man squad of Land Raiders. Somehow I can't imagine the current version of the Land Raider looking quite so iconic in Epic scale. 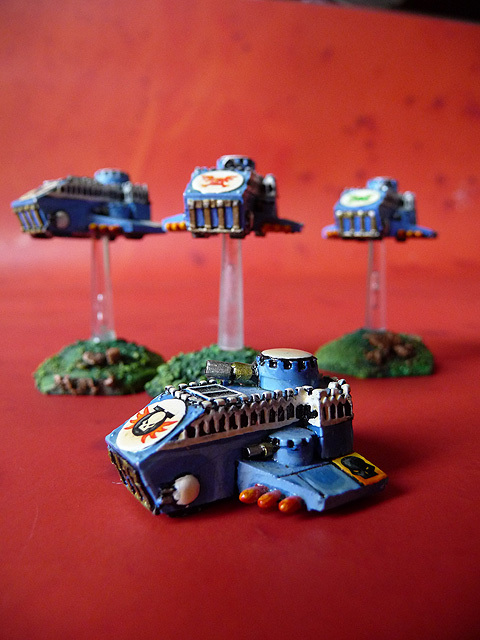 The paint style is overly exagerated, much like my firend Jay's Ultramarines from around that time. I removed the tiny door viewports so I could have a flat surface to add the number decals. 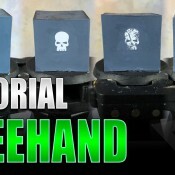 Each unit of three with a separate identifying colour, white, yellow, green and black for the command tank. 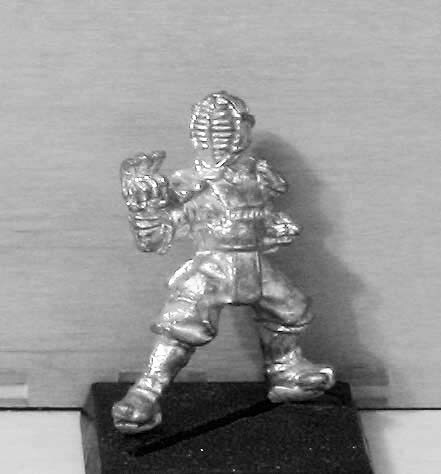 When I first started gaming many of my Citadel Miniatures were Ninjas. I say 'my' but what I mean is my brothers. I said to him one day while walking home from school I'd quite like to try Dungeons and Dragons. I don't know where the idea came from. It just popped fully formed into my head, it may have been inspired by the Warlock of Firetop Mountain books I don't know. He actually found someone in his year at school who was into role-playing and it was a Ninja based game. I was too young and he certainly didn't want me hanging around with his new mate so he went and played a game with him. I remember interrogating him ruthlessly on his return about what it was like. So he bought a load of Ninjas and I still have many of them today, hey, I could dig them out and photograph them. Anyhoo BloodBowl introduced it's Star Player's and one I had to have was Hoshi Komi, you can see him in all his toxic lead glory below. Actually there's a french website with loads of info on him here and some painted shots too.﻿ This guy was cool, aside from Frank N'Stein, the coolest star player there was. But what was the coolest thing about him? His Ninja claws, his pose or his Ninja mask and armour? Well it ain't his Ninja mask because that isn't a Ninja mask, it's a Kendo helmet [known as a 'men'], it's a Kendo chest protector [known as a 'do] and part of a Kendo groin protector [known as a 'tare']. Funny thing is over the course of my initial gaming affliction we went from GW battles to role-playing aand eventually Live Role Playing, something I actually did with my brothers Ninja-gaming friend. When I went to University I stumbled across a poster in the local Post Office window advertising a local Kendo club. I popped down the next Tuesday hoping to gain new skills to use in LARPing. Call it destiny, fate, whatever but it was their last night in that venue. From then on they'd be in a school a couple of miles away and if I hadn't have gone then I'd never have got a lift to future practices and probably never checked it out. Over the course of the next four years I went regularly every Tuesday. I continued to paint my figures, made a chainmail vest for LARPing, by hand, from scratch but as time went on those hobbies lost traction. I had no one to game with and role playing wasn't real, Kendo was. When I came home from University without transport to the local Kendo club in Liverpool I stopped practicing. For nine years I gave it up, along with those other hobbies. Practical reasons - transport, children, cost and more pathetic reasons - laziness and fear stopped me from going. When I did return, in part due to threats from my wife to throw away my Kendo armour I realised those nine years were a complete and utter waste, what had I been missing? Four years on I'm still going. I still love it but a number of persistent injuries impacted my enjoyment levels. Particularly last year when I took a few months off. 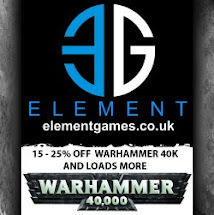 At those times my 'addictive' aspects went looking for new obsessions and thats when 40k caught me at my weakest ;) Anyway I'm carrying on through the pain and there's big things coming up next year for our club which is why I mentioned pressures on my time. You may even have seen some of this if you checked out my Blogger profile and saw my other blog for the Liverpool Kendo Club. Suffice to say I see Kendo as some kind of weird gaming extension, I doubt anyone else will. But, it's the closest I'll get to being on a battlefield, actually that's not entirely true I went to the Gathering in Derby. 3,000 LARPers and I stood in the front of a massed rank of tower shields facing a huge opposing force, I quickly found a nice spot at the back of the formation! 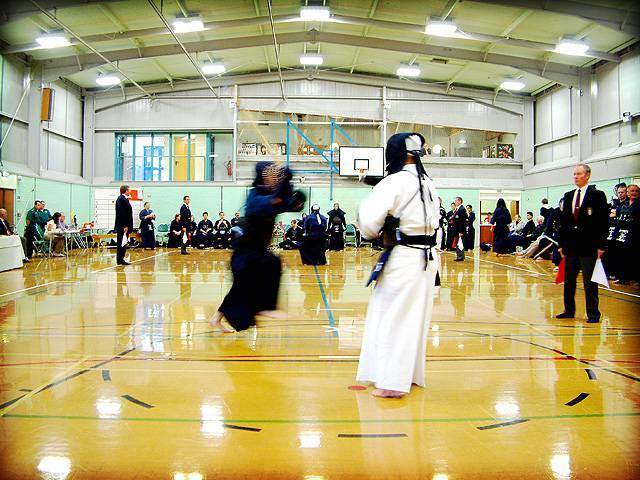 Kendo can be the physical embodiment of some of the battles we play out, just so long as you're not getting your dice and tape measure out in the middle of class! It's a total challenge, many aspects to master and a learning curve like no other, after eight years I can be as clueless as the day I started. At least I'm glad it's not the only hobby I brought back into my life. Anyway Hoshi Komi's a cool figure, I have one 'cooking' in some Dettol, a purchase from my old friend BiG Pete, he's even got bits of Middenheim Marauder paint bonded to the lead still! 'nids part 13. More Prime! It's a good few weeks back now that this guy arrived in the post after I won him on ebay. £2.49 including postage, bargain! 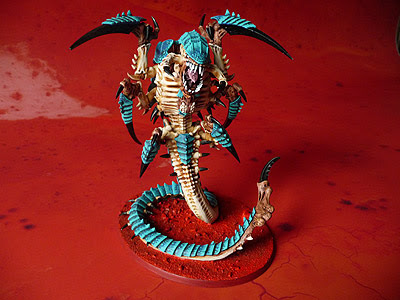 So you can guess he's going to form another Tyranid Prime. As you may recall [well you will if you click on the link] I had plenty of original Tyranid Warrior torsos, but a severe lack of legs. 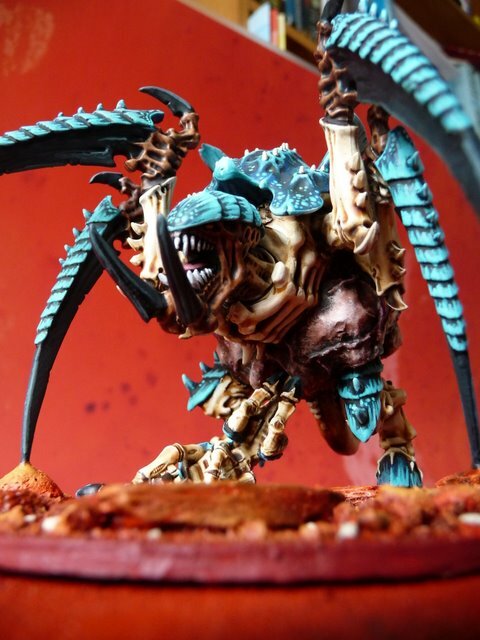 So anyway when I decided a second Prime with Deathspitter, bonesword and lashwhip would be more effective for my Son's weaponised Warriors I had to get another one. The bonus, well I can actually document the conversion process for you, something I could only describe previously. 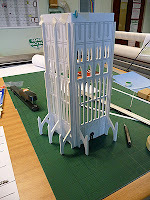 I may even get some more and convert them up on ebay for sale, they're easy enough to do, although I did stab my thumb with the scalpel, it's not like I was even doing anyting daft, still we'll learn. Further pics to follow, of the Prime, not my bleeding thumb! I've always had problems with painting realistic bases. 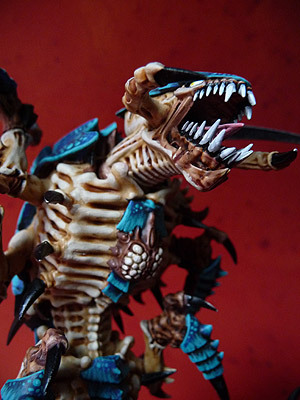 Some have worked others I've been ultimately disappointed by and there's nothing worse than having a cool looking model spoiled by a shoddy base. When I was painting my Empire WFB army in uni I only put model railway gravel down. I remember distinctly congratulating myself for this decision because they looked neat and didn't require any extra painting, figures painted, gravel on, job done [I must photograph those figures...]. As you can see the Vermillion matched perfectly our Red Planet terrain base map. 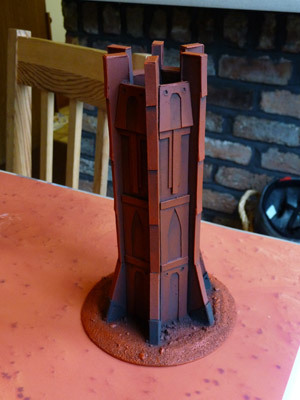 The slightly thinned paint allowing the natural tones of the sand and lava stones to show through. I'd also fretted about the base edges as the pigment in the Vermillion was quite thin, successive coats, even on a white undercoat didn't work. I asked the manager in my local GW store if I could try some Mechrite Red on the edge and I was blown away. If I'd have left the Vermillion it would have been patchy in places and would have blended near invisibly with the board but the darker Mechrite makes them stand out so much and yet still works because it's tonally similar to the boards shadows, as you can see. At any rate most GW basses are green with a brown border so having the sides a different colour clearly works or they wouldn't have been doing it this way since I was a lad. The finish was certainly an improvement, so I bought a pot there and then [good sales technique on behalf of the manager there]. So all my bases were now Vermillion and Mechrite red but that little voice was telling me leaving it plain was not good. I needed to add shading and highlights regardless of how long this may take. The other voice was telling me to leave well enough alone before I messed them all up. I cut some strips of hardboard and added sand and tried four or five different versions to get to my happy place. Bearing in mind I was dealing with the same issues with hills and craters for the rest of the scenery, this was a major deal breaker. Eventually I ended up with a recipe I was happy with. More importantly I reasoned that although the Vermillion matched my print out I may not always be using that for our battlefield. 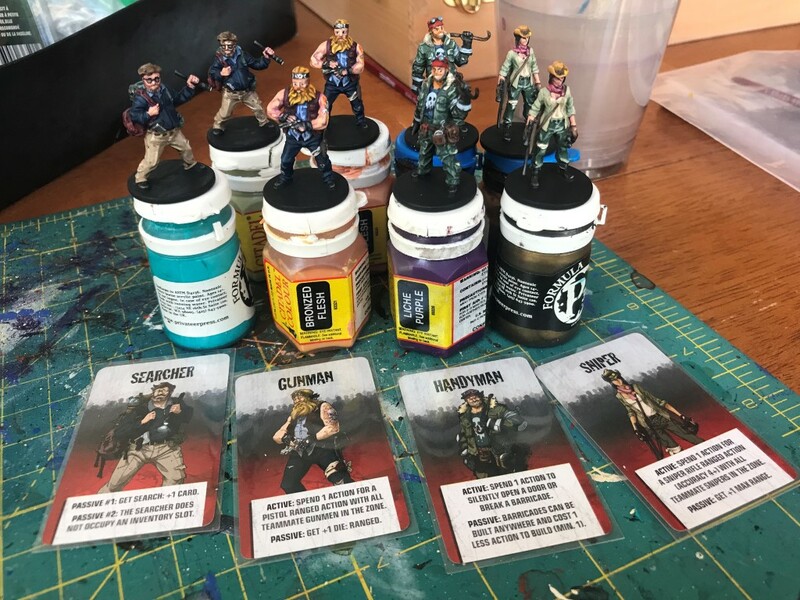 If I have to paint one then surely that will match the base so it's better to match something I can control in the future instead of something I may discard. My recipe ended up so simple I'm quite surprised it took me so long to get it right. After the Vermillion I used a Badab Black wash, I'd tried, Devlan Mud and also thinned Chaos Black, and thinned Chestnut Brown craft paint [cheaper than the washes] and decided Badab Black worked best and as I hadn't used it much in the rest of the army I had more than the Devlan Mud left so it was not the cheapest option but the second best. A quick dry brush with the Vermilion brought back some of the colour, then adding some bronzed flesh and a very light drybrush on some of the bigger stones and edges lifted the texture just that little bit. Finally, the masterstroke was some Bonewhite stones. Picking out the odd one scattered here and there really made the base 'pop'. In some ways I now find the bases even more interesting to look at than the model! That may be completely wrong but I love looking at all the texture. It's not extremely difficult to do either, the graded sharp sand pretty much presents which little stone to make Bonewhite and all you need is a bit of patience and a steady hand and job done. Admittedly I then had to go back and touch up all the little mistakes my drybrushing made but overall, after many hours I was ecstatic with the results and satisfied I'd ignored the lazy little voice. 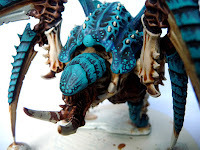 So lets bring back my old friend - Broodlord in a Body Warmer so you can see the difference, not to mention the highlighted talons versus plain black ones. I think it was the right decision in both instances. 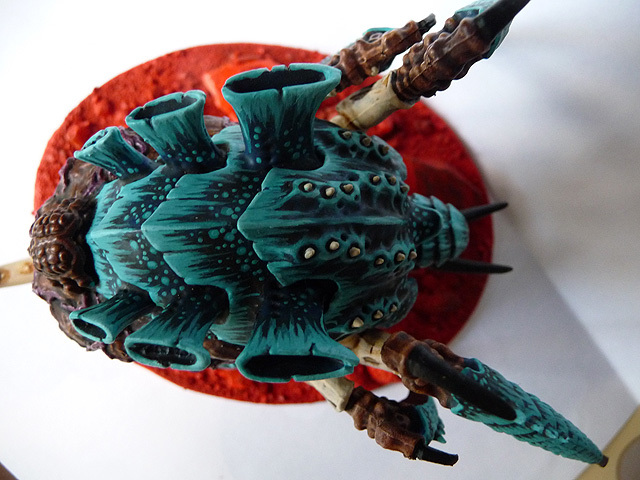 Hope you give Red Planet basing a go. 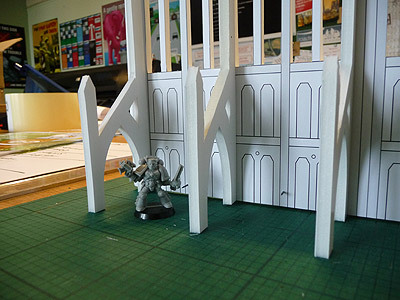 We popped on down to our local GW on Sunday to see if we could get a game. There's a new manager [again!] and so times have changed, WFB from 11 - 12:30 then 40k until 2:30. So my son and I got to hang around the store for an hour and a half before we could play. I suppose that's not too bad if it weren't for the fact no one came to play Fantasy so the sole gaming table was left empty and unused for those 90 minutes! It was about half way through the game that I remembered to take some photos with my phone, which aren't too bad considering it's an old Sony Ericsson W810i. 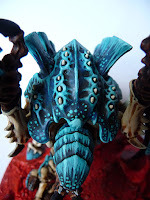 Of course this is going to introduce you to some other members of the Hive Fleet so far, I really should do an army list. So what had happened up until this point. We went first and everyone moved forward, the Tervigon spawned 9 Termagants on the first turn, getting 1 and two 4's so pooping out for the remainder of the game. The nine new-borns moved up to that dry-stone wall on the right of the picture below, just in range to capture the wounded marine objective you can see behind the Tervigon. Everyone else barreled up the hill. The HVC fired and hit but didn't do any damage. My son's Space Marine opponent jumped his Assault squad into contesting the objective and that was pretty much it. My son's turn and the Dev-gaunts were in this position and fired on the Assault squad. 30 shots and there was better than the 50:50 result and the wounds were better than average again. If I recall there were 11 wounds! So the opponent rolls and makes six saving throws, bye-bye assault squad. Now the assault you see below is a turn later, his command squad ended up far forward, my son ran those warriors up the hill for 2 inches nowhere near enough to get into combat although I suggested he fired instead he had his way [as he should]. There's three Termagants [from the original 9, some lost to bolter fire, though 1 out of 5 perished in a frag explosion, the rest saved due to the wall] in combat and the Tervigon has taken two wounds. Three of his command squad have been obliterated, through assault and shooting etc. His team mate decided to burn those bikes over. Continuing on not much happened, the those in assault traded ineffective slaps on each other but without the extra attacks on the charge and the Tervigon's low Initiative nothing much happened. A frag missile did deviate from the Dev-gaunts into the back of the Tervigon but it's monstrous girth protected it. "What's that coming over the hill? Is it a Dev-gaunt? Is it a Dev-gaunt?" That's right the Dev-gaunts crest the hill and can you spot the difference? Mmm where did those bikes go? 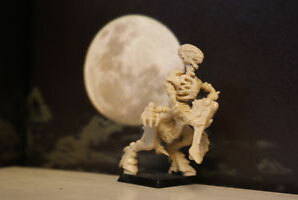 They were eaten by Devourers! Just behind the Hive Tyrant the Warriors charge forward hoping to break the deadlock in this assault. At this point, later in the turn, the Hive Tyrants HVC has taken out two from that Tactical squad in the background the Warriors came in and combined they mopped up the rest of the command squad leaving the 10 man squad at the back and those three next on the menu and the objective in our hands. At this point we had to leave but I think my son did really well. We were unlucky with the Tervigon in the first turn but he only lost 6 Termagants, 2 wounds on their mother and a wound on a Warrior in the game. 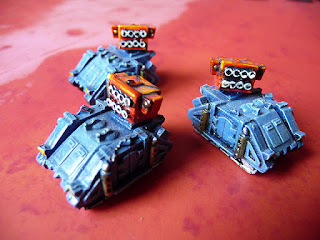 The Dev-gaunts get MVP for the Assault Squad and bikes, it's amazing what just 10 of these can do. 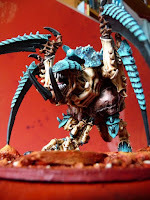 The Hive Tyrant did chuff all but I could imagine there would have been very little left of the opposition if we'd have played on and got the big hitters into play. Goodness knows how the Necrons got on, I don't think they suffered many losses, it's awfully difficult to keep these kids on track especially when you've got a deadline for when you're going to leave and they haven't even brought their Codex! 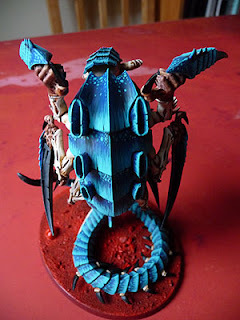 'nids part 12. 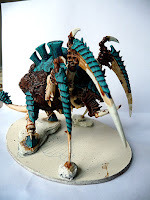 The Tervigon Tutorial part 8. Here we are, as near as dammit the end. I'll probably have some more shots to add once I've varnished it and added some alien bogeys on the Termagant. Originally this was to be done wit my hot-melt glue gun, I even got some coloured glue sticks for this. 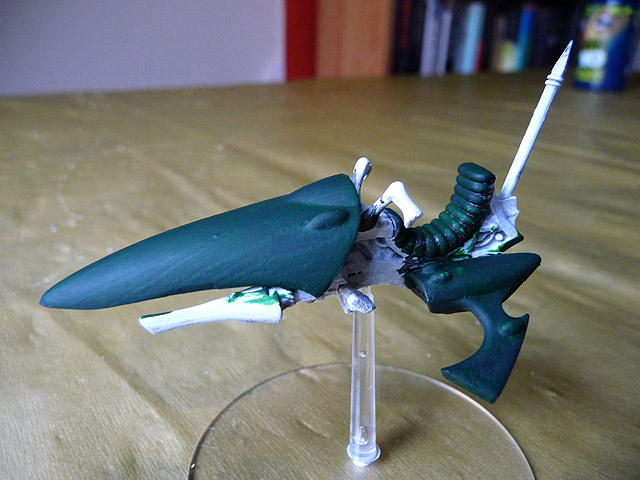 But I think it's too tricky to get the gun into the space around the talons to ensure a quality finish. I've looked at some other tutorials that show how to do it so I may employ those techniques, more once I've completed it. Actually one set of highlights have been added to the talons here but a pure white sparkle/reflection was added at the very highest spots, these worked really well on the Hormogaunt talons. ﻿The membrane sac continued to be awkward. I wanted to reintroduce the transparency and glossiness from the PVA so mixed a thinned down PVA and the same £1 Vermilion acrylic art paint used on the base. This worked like a wash in a way. It collected and pooled in all the recesses, you should be able to make out what remains beside all the veins. I still wasn't happy though and stippled successively lighter highlights on all the bulges. Eventually I was happy, not 100% but enough. It's not quite the semi-transparent effect I was after but I have some gloss varnish that I can use to add a little more depth to it. Below you can see also how I highlighted all the veins and the adrenal gland, somehow managing to realistically blend it in to the rest of the creature. Basing was also a nightmare. I've always had problems with painting realistic bases. 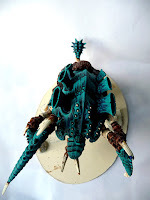 Some have worked others I've been ultimately disappointed by and there's nothing worse than having a cool looking model spoiled by a shoddy base. 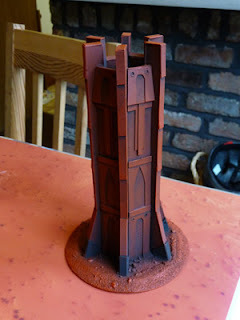 Anyway, I can write a whole post on the basing dilemma itself so I'll leave that for another time. 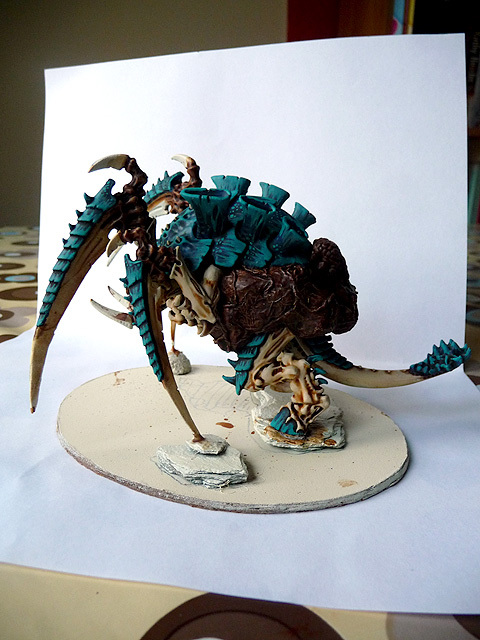 Here I'm still not sure whether I should add in the black slate like I did with the Tyranid Prime part of me thinks it'll be another colour to draw focus away from Tervigon itself and I kind of like how the Vermilion opacity has given interesting patination on the slate. For the time being I'll leave well enough alone and not listen to that persistent little voice. 'nids part 11. 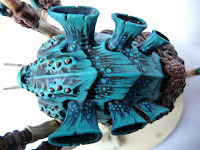 The Tervigon Tutorial part 7. ﻿You can see that the Termagant spawn has also been finished and sits quite well on the now fully textured base. You may spot a couple of adrenal glands in the red planet soil. I wanted them there to represent tiny Tyranid organisms searching for symbiotic hists to bond with. Teeth were all done in grey with white highlights, the tongue was purple. You should be also able to make out how sparingly the 2nd turquoise highlight was used, particularly evident on the chitin on the head. You can also see the purple veins on the egg sac. I really struggled with colouring the membrane later on, I wasn't 100% happy with it here and trust me it got worse before it got better. Next up, basing and everything else [minus talon highlights]. 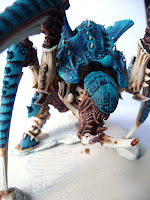 'nids part 10. The Tervigon Tutorial part 6. Here we go, part 6. This is the first set of highlights complete on both the bonewhite and chitin parts. 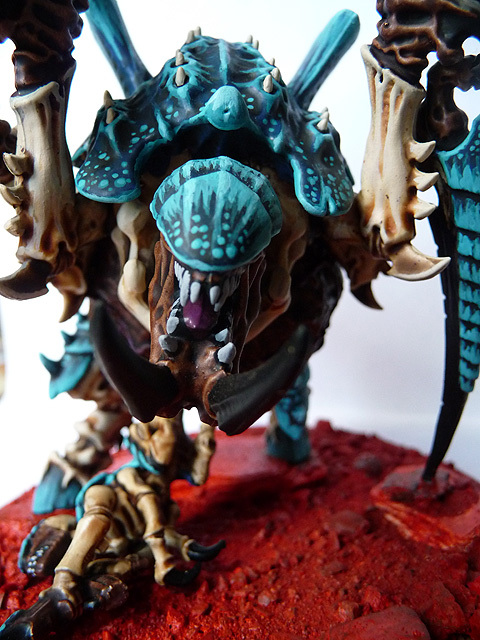 Again the curious properties of that craft acrylic turquoise, both opaque and transparent depending on how you apply it really lends a natural, organic feel to the beasties. 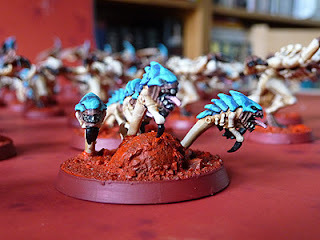 When I first painted genestealers in my youth I hated all the limbs I thought they were a night mare to paint. With washes and the understanding that mistakes can be explained because nature is not perfect then I truly believe Tyranids may be the easiest models to paint. I mean when you paint a Space Marine that man-made power armour screams out any imperfections. Of course if you go the distressed battle scarred armour you can disguise a multitude of sins but still it requires a certain amount of skill to get decent results. You can see how the dotted pattern works as well here. This was first employed on my Son's Trygon. The stripes weren't quite as significant so there was much more dark blue which needed something to break up the space. 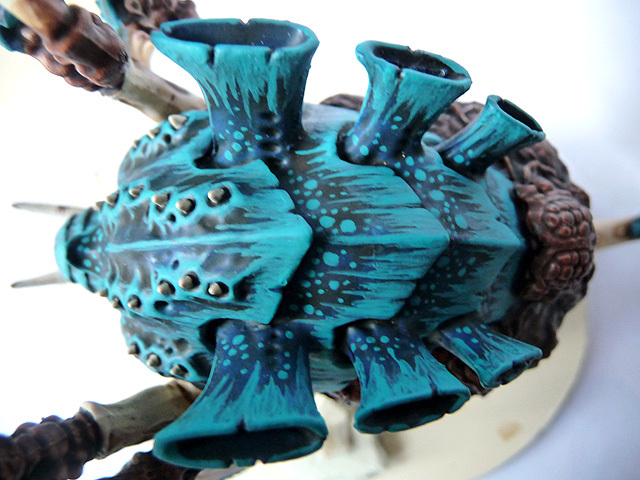 I put a few dots on, suggesting that older/bigger beasts develop more patination over time. It allowed me to spend a bit more time on these showcase models and lift them above the rest of the horde. Saying that though I did apply some dots to a few Gargoyles. ﻿[Damn that mold line still looks ugly!]. The dots are easy to do just a small brush and dab, dab, dab. Of course you could use a cut cocktail stick for perfect uniform circles. Bone white highlights were also applied. 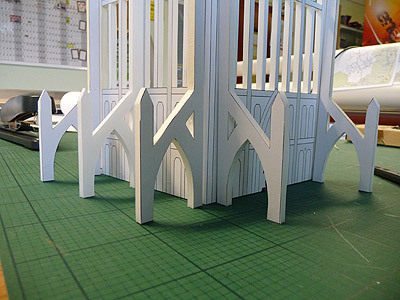 Bonewhite isn't a particularly opaque colour but in this situation it doesn't matter. Once again levels of opacity help all the colours blend so you never get flat colour you get depth, mottling and imperfections, just like nature . ﻿Next up - more highlights, talons, teeth and base. 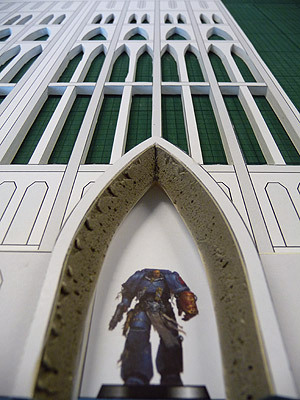 Terrain is everything - 40k Cathedral Tower. So here's one of my 'what's on my work table' kind of posts. 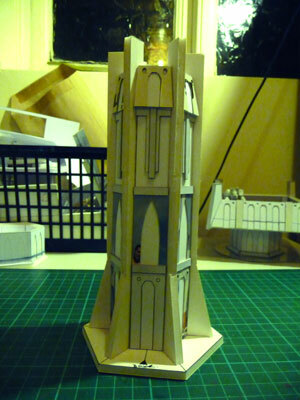 This beauty has been around for a while actually and much like the little 'vent tower' is a long term work in progress. There's no real incentive to get this done actually. Our small table has far too much scenery and we hardly ever play so this is really only a vanity piece. Something bigger and grander than anything before. As you can see it's like a Cathedral Tower and was going to feature another ruined corner with plenty of floors [though how you would get between them is anyone's guess]. Since I found out that ruins aren't so hot I'm loathe to create another one. Of course, if I make it structurally sound, mostly, I'll also have to make a ruined version for when it gets flattened. 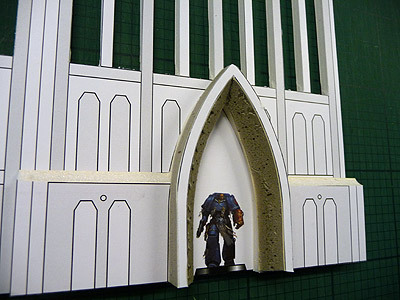 Above you can see how some 10mm foam card got used for the arched doorway and the space marine is there so you can see the scale of the building. Below was my tests regarding flying buttreses. I've decided to go with three instead of the five. 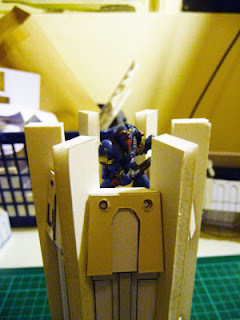 It uses less foam card and gives more room for figures to gain cover from. You can see five was just too dense. I'll be adding some hexagonal window-blind rod [or bic biro] to the spikey bits for some more flavour. Here's how the corner works with the buttreses although the extra ground level reinforcement isn't in place. Funnily enough when I started this I had to take all the prepped foam card home but when I actually got round to starting cutting I ended up using some other foamcard so when I get chance I've a second piece in the works. 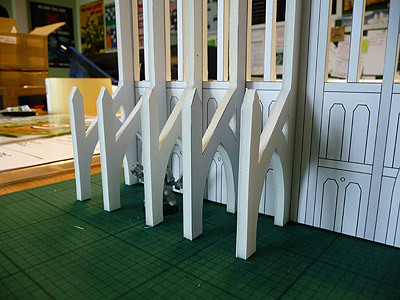 If I worked it out right I could in fact have four corner pieces, although clearly this works well by itself, once I start to ruinify it there'll be significantly less building﻿ which may diminish it's impact on the field. It'll be a judgement call in the end. 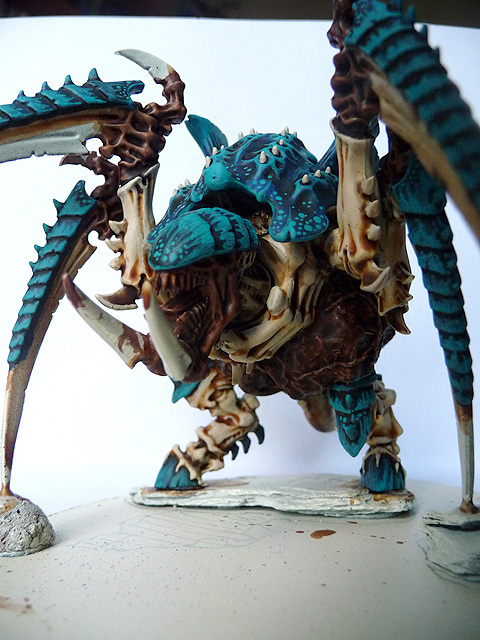 'nids part 9. The Tervigon Tutorial part 5.